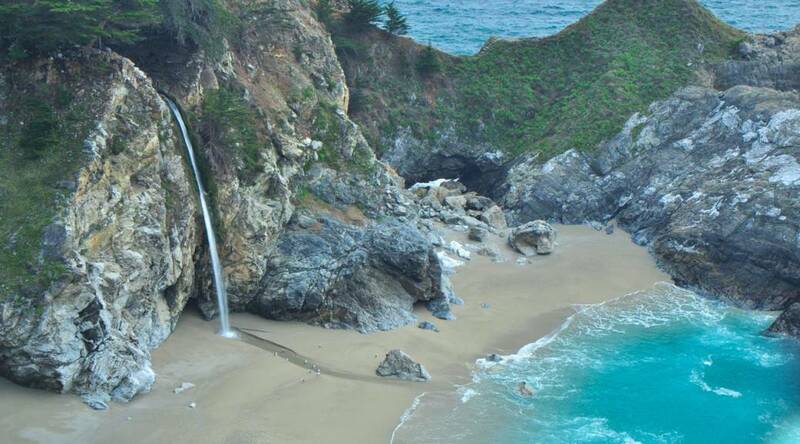 Big Sur California has one of the world’s most unforgettable stretches of coastline. This 90-mile-long stretch of redwood trimmed waterfront between Carmel-by-the-Sea and Hearst Castle draws you in with it’s allure and beauty. This is, quite simply, enchanting – bluffs, sea, and sky. 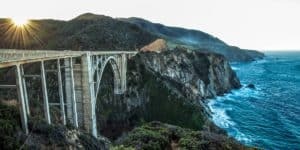 The classic drive through Big Sur, along Highway 1, offers plenty of pullovers at places like Bixby Bridge. 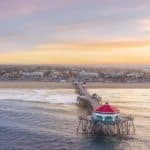 Stop at parks along the coastline and look up to see endangered California condors, North America’s largest birds, or look down to scan the swells for migrating whales or sea otters floating among dense beds of kelp, California’s signature seaweed. 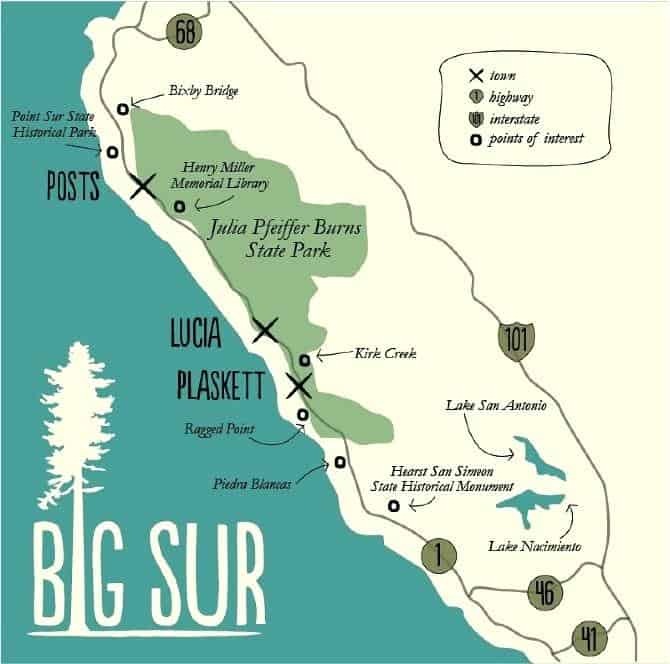 There are plenty of campgrounds to include Big Sur Campground, Fernwood Resort, Riverside Campground, and Pfeiffer Big Sur State Park. The region’s beauty also makes it a magnet for exclusive, upscale hotels like the cliff-hugging Post Ranch Inn, or luxurious Ventana Big Sur. For a list of all the area beaches << Click Here >>. A Big Sur California Vacation will give you a sense of well-being, with the cliffs, rocks, redwoods and bubbly surf that create an epic backdrop for recreation, romance and relaxed exploration. The best time to visit Big Sur is from September to November. With more than 300 days of sunshine per year, Big Sur’s peak season runs long, from April to October. However, once August passes, crowds start to disperse and high temperatures inland start to drop, leaving more room for visitors to wander on the coast and the mountains. Winter, especially December, is considered the best time to visit Big Sur if you’re looking for a deal on lodging. But these cheaper prices do coincide with the rainy season and often even road closures. Spring ushers in cooler temperatures and the bloom of the area’s beautiful wildflowers. Summer is the busiest season, offering visitors pleasant temperatures and plenty of activities and programs offered by the region’s parks and educational societies. But along with heavy crowds, coastal fog is another downside; it can hang around as late as midday. It’s important to note that temperatures in Big Sur vary by geography. Temperatures on the coast tend to be cooler than the mountains, especially during the summer, so be sure to pack a jacket any time of year. Limekiln State Park is one of the smallest state parks in Big Sur, but has some serious history. The 716-acre park is named after the limestone business that once thrived here. In the late 17th century, the Rockland Lime and Lumber Company would quarry limestone then smelt it in a series of wood-fired kilns located in the park. This process produced powdered lime, which is an important ingredient in making cement. The beach at the park acted as a harbor to ship out the powdered lime to other regions. Limekiln State Park is located on the steepest coastal canyon in the continental United States. It is also one of the only parks in Big Sur that offers direct beach access. At Limekiln, all you have to do is park your car and the beach is steps away. Pfeiffer Big Sur State Park is adjacent to the Los Padres National Forest and covers 1,600 acres on the western slope of the St. Lucia Mountains. Like most state parks in this region, Pfeiffer Big Sur State Park features redwood groves, open meadows and waterfalls, but what sets this park apart is its location. This park is further inland and doesn’t offer many ocean views. 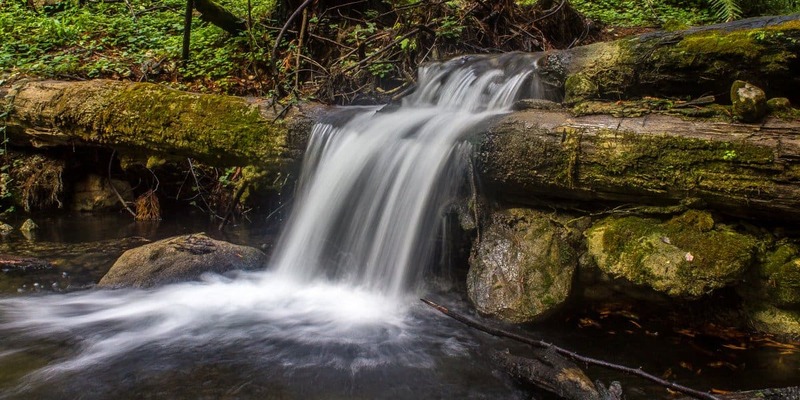 Instead, the main water source is the Big Sur River, which runs through the entire park and is a feature hikers will see while traversing some of the park’s trails. This 4,800-acre park is the largest state park on the Big Sur coast and offers multiple activities and attractions, not to mention several hiking trails. 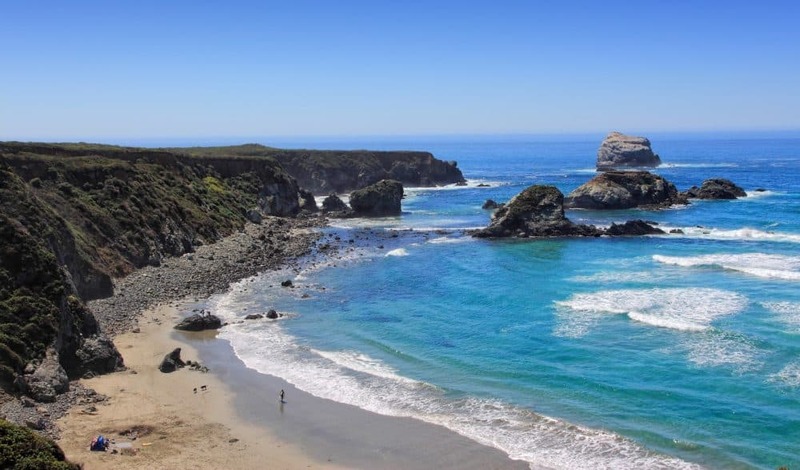 Named after the man who brought the artichoke to California, Andrew Molera Park’s natural wonders include secluded beaches, redwood groves, meadows and the Big Sur River along its 20 miles of hiking trails. Because of the park’s flatter geography, visitors are allowed to bike and can take horseback rides throughout the park. 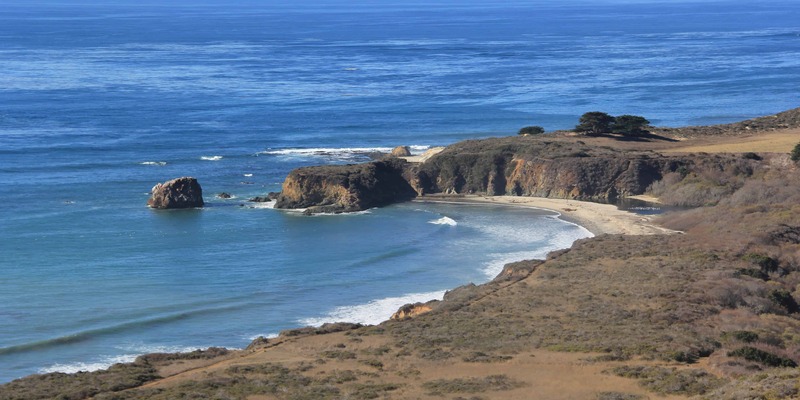 The beach is also safe to surf, and is considered to be one of the best surfing spots in Big Sur. Julia Pfeiffer Burns State Park is a favorite among both locals and tourists. A feast for the eyes, the park features seven marked trails that take travelers to tucked away coves, up to waterfalls, along miles-long creeks, through redwood-clad forests and more. Not to mention, it is one of the few areas in Big Sur where scuba diving is allowed. The shortest and most traveled path is Waterfall Overlook Trail. 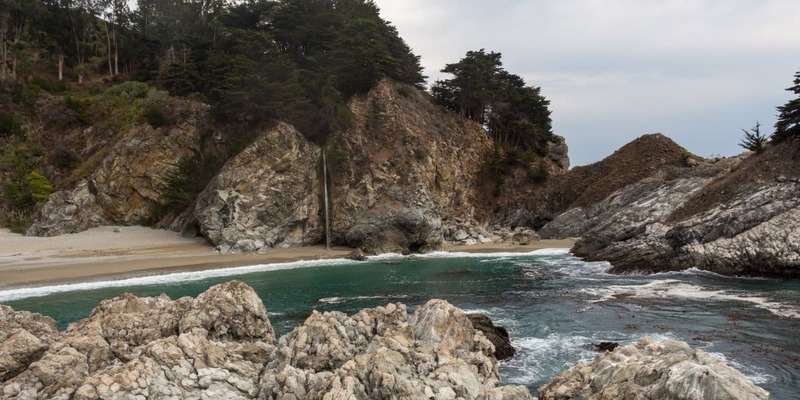 Less than a mile long, the trail takes visitors to one of the most popular attractions in Big Sur: McWay Falls. The site is lauded for its beauty, and is a culmination of all geological features typical to Big Sur: The secluded beach is flanked by jagged bluffs covered in shrubs, wildflowers and cypress trees. The falls, flowing from atop one of the cove’s granite cliffs, tumble 80 feet down into the cove and get swept up by the ocean. The cove is also a prime place to spot migrating gray whales that pass through Big Sur from December to February, as well as March to May. Located about 7 miles south of Andrew Molera State Park next to Los Padres National Forest, Pfeiffer Beach is secluded in feel, offering expansive shorelines covered by towering, vegetation-heavy bluffs and striking rock formations. The beach’s most famous rock formation, however, is located a few feet out into the ocean. The Pfeiffer Keyhole Rock is hard to miss thanks to its distinguishable arch. It’s also considered the most-photographed attraction in Big Sur after Bixby Bridge. At low tide, visitors are able to wade through the water and take a Pfeiffer Keyhole Rock look at the surrounding tide pools. But the best time to see the rock is at sunset when the sun shines brightly through the keyhole, creating a spectacular photo op. Situated between the base of the St. Lucia Mountains and the rugged Pacific coastline, this 3,000-acre state park is overflowing with trails highlighting the park’s diverse landscape. From coastal headlands to redwood canyons and a valley lined with calla lilies, there is terrain to appease every type of traveler. Garrapata has five main marked trails, four of which are grouped together in a loop going up into the St. Lucia mountain range. The Rocky Ridge Trail takes travelers through shrub-lined canyons, leading up to two towering lookout points. The more coastal 2-mile-long Soberanes Point Trail snakes around Whale Peak and makes a pit stop at the scenic Soberanes Point. If the beach is all that you’re looking for, there are various coastal trails that take you around and down to Garrapata Beach. This bridge is arguably the most iconic spot in Central California. It’s featured in the film “Play Misty For Me” as well as numerous automobile commercials, it’s the subject of a song by Death Cab for Cutie and as of this year, it even has its own postage stamp. The bridge is a favorite attraction for photographers, from professionals to those in search of the ultimate depth-of-field selfie. But whether you are snapping away or not, be sure to take advantage of the multiple viewpoints; they are key for reveling in 360-degree views instead of just the direction you are going. 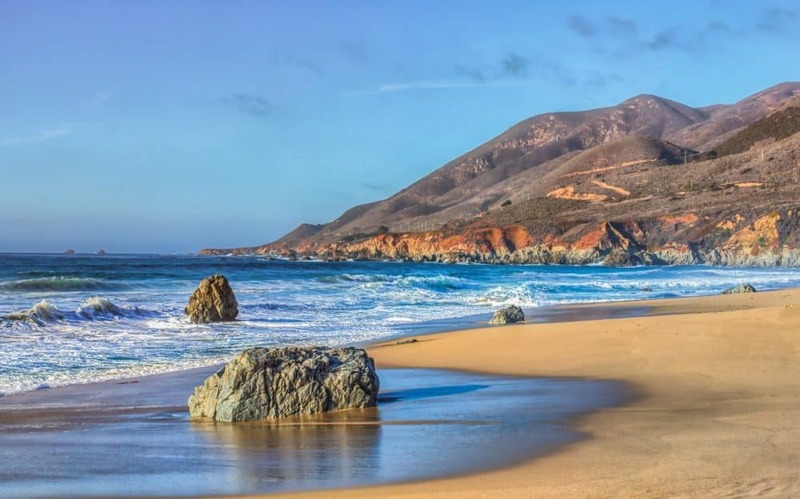 A great option for those who don’t want to work up a sweat on the trails but want to experience Big Sur’s beauty from outside the car is Sand Dollar Beach. Located about 7 miles south of Limekiln State Park, Sand Dollar Beach is the largest unbroken stretch of sand in Big Sur. Along with the beach at Andrew Molera State Park, this crescent-shaped shoreline is considered to be one of the best surfing spots in Big Sur, and is also a hot spot for fishing. The most popular activity, however, is beachcombing. This shoreline gets its name for a reason, as its often graced with washed-up sand dollars. There are also a plethora of rocks located at the southern end of the beach, which are known to contain minerals like serpentine and jade. Hurricane Point is one of the highest points on Highway 1 in the Big Sur region. From this vista point you have clear views to the North, South and West. Because of this wide-open area, it is very windy, hence the name “Hurricane Point”. You can see the Bixby Creek Bridge to the north from this vantage point. With its quaint English décor and cozy fireplaces this four room restaurant has all the charm of an English countryside cottage. Founders Norwegian born Helmuth Deetjen and his wife Helen have never ceased to give their guests a homely welcome at this rustic inn tucked behind Highway 1. Try the Eggs Benedict and homemade granola on the restaurant’s award-winning best breakfast menu to Chef Domingo Santamaria’s paella with freshly caught seafood brought in from the nearby Monterey Bay, or his sun-fed filet mignon. Deetjen’s prides itself in locally sourced organic products and features on the US national register of historic places. For more information call (831) 667-25377, or visit them on the web at Deetjen’s. Enjoy wood fired cooking, satisfying the taste buds from brunch to dinner. Scrambled eggs are served on wood fired sourdough toast; an exciting assortment of serious meat or fish sandwiches is on offer for a lunch time treat; wood fired pizzas oozing with different flavors such as eggplant with goat’s cheese or green olive tapenade are served straight from the oven; and a simple wood fired breadboard with butter and sea salt opens the appetite before tucking into the restaurant’s seasonal menu. It is worth leafing through Big Sur Bakery’s cookbook for a taste of the four seasons according to Big Sur Bakery. For more information call (831) 667-0520, or visit them on the web at Big Sur Bakery & Restaurant. At 12,000 feet above the Pacific Ocean and perched on the edge of a cliff, the panoramic views from Post Ranch Inn offer one of the best places to watch the sunrise or sunset over gourmet cuisine. Post Ranch Inn features on Condé Nast’sGold List and is considered one of Big Sur’s most luxurious resorts. Its Sierra Mar restaurant is no exception to this with its innovative cuisine and award winning wine selection. Chef John Cox experiments with a host of flavors from seaweed champagne to elk with rhubarb and pickled green strawberries. All ingredients are locally sourced and even the hams are cured and smoked on site. For more information call (831) 667-2200, or visit them on the web at Post Ranch Inn. The Big Sur Roadhouse features delicious California cuisine with fresh, local ingredients. In keeping with our Big Sur ethos, the seasonal menu is filled with locally sourced organic ingredients. Also, not to be missed, San Francisco designer Steve Justrich’s “homegrown modernism” has transformed the Roadhouse into a truly unique and fitting environment for dining in Big Sur. Please stop by for coffee, a glass of wine, a snack or a full meal. For more information call (831) 667-2370, or visit them on the web at Big Sur Roadhouse. Lolly and Bill Fassett opened Nepenthe, ‘The Isle of Care,’ in 1949 and over the years have witnessed the passage of some famous names, including Henry Miller or Elizabeth Taylor and Richard Burton, who filmed scenes from the Hollywood film ‘The Sandpiper’ here in 1969. The restaurant’s signature roast chicken with sage stuffing and cranberries features on a traditional menu among Big Sur’s most succulent steaks and Ambrosia burgers, which are made with coarse ground meat from naturally raised beef. At the same address, Lolly and Bill Fassett’s Café Kevah provides wonderful views of the Santa Lucia Mountains and the Big Sur coast . For more information call (831) 667-2345, or visit them on the web at Nepenthe. Just south of the Big Sur River Inn, this dive has an encyclopedic beer bible and motley local musicians jamming, mostly on weekends. Sixteen rotating taps and three pages of bottled brews create havoc for the indecisive drinker. For more information call (831) 667-2355, or visit them on the web at Maiden Publick House. Down California craft beers and regional wines on the back deck or by the fireplace inside this high-ceiling wooden bar with board games, sports on the TVs and pub grub from the next-door deli. 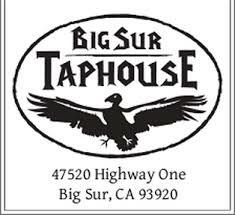 For more information call (831) 667-2225, or visit them on the web at Big Sur Taphouse. Fernwood’s tavern is a popular local watering hole built in the traditional Big Sur style with redwood timbers. Fernwood’s homespun atmosphere attracts a variety of locals and tourists, making for some very entertaining evenings. Very popular on evenings when live entertainment is available – usually Saturday night beginning at 9:30 PM. They also host spring and fall music festivals in the campground. For more information call (831) 667-2422, or visit them on the web at Fernwood Tavern. The Sur House restaurant, helmed by Executive Chef Paul Corsentino, rises high above the Pacific where the forest and sea converge. Drawing on his experiences in kitchens across the country, Corsentino crafts coastal cuisine—using Pacific-sourced seafood delivered by local fishermen, free-range meats from local farmers, produce from nearby foragers and homemade accoutrements—inspired by the sustainable ingredients of California’s Central Coast and the melting pot of America’s culinary havens. A 10,000-bottle cellar of small-production Central Coast wines has been carefully assembled by a team of local vintners and The Sur House sommelier. Craft cocktails and a curated selection of beer, along with a specialty bar menu, also are offered. For more information call (831) 667-4242, or visit them on the web at The Sur House. 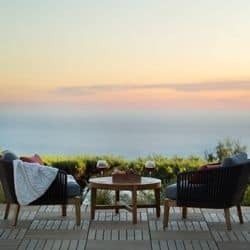 An exclusive 5 star resort set amid 160 forested acres on the rugged Pacific coast, Ventana (Spanish for “window”) is both inspired by and reflective of its majestic setting in Big Sur. Watch the sun set over the ocean. Explore rolling hills and old-growth forests. Reconnect with your body and spirit. With a thoughtful combination of private sanctuaries and interactive, social spaces, this is a place for all — whether you’re looking for romance and connection, or more interested in solitary reflection. Whatever you seek, you’ll find inspiration at Ventana. For more information, pricing, or to reserve your room visit Ventana Big Sur, An Alila Resort. Located in the sunny Carmel Valley, Hidden Valley Inn offers a convenient home base for exploring Monterey Bay, Big Sur and the California coast. 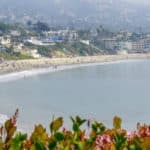 Carmel Valley and its picturesque village have long been known for spectacular natural beauty, excellent cuisine, rustic charm, and world class wines. Discover the beautiful valley and quaint village within steps of Hidden Valley Inn. For more information, pricing, or to reserve your room, visit Hidden Valley Inn. Just minutes from Carmel-by-the-Sea and the famed Monterey Peninsula, is Carmel Valley; a serene escape for its many year-round visitors. No matter what the season, Carmel Valley is known for its sunny, fog-free days, cool nights, and warm ambiance. It’s a peaceful setting, with over three acres of lush flowers fruit trees. The charming Garden Patio Rooms, Fireplace Suites and Cottages are newly renovated and totally upgraded for your pleasure and relaxation. For more information, pricing. or to reserve your room, visit Carmel Valley Lodge. Once a luxurious mansion built in 1905 by an artist as a gift to his wife, a member of the Ghirardelli family, for over 100 years La Playa Carmel has been known as the “Grande Dame of Carmel.” Newly restored, this 75-room historic hotel is located just steps from the sands of Carmel Beach and the renowned shops, galleries and restaurants of charming Carmel-by-the-Sea. The cornerstone of one of California’s most prestigious neighborhoods, this landmark Carmel Hotel features meticulously tended gardens, intimate patios, secluded courtyards and a tranquil terrace swimming pool. For more information, pricing, or to reserve your room, visit La Playa Carmel. A serene sanctuary nestled among the tree-lined streets of Carmel-by- the-Sea, Tradewinds Inn radiates calm and comfort. Originally built in 1959, this ideally located boutique hotel incorporates Japanese, Balinese and Chinese décor elements in its 28 rooms and throughout the premises. Set against a backdrop of the Pacific Ocean and just steps from the town’s shops, galleries and restaurants, Tradewinds features a tranquil private courtyard and meditation garden with cascading fountain, bamboo trees, lush flowering ginger and cozy fire pit. Inside, guests will enjoy well-appointed rooms with luxurious linens and high-end amenities in addition to a daily continental breakfast featuring the area’s best French pastries. For more information, pricing, or to reserve your room, visit Tradewinds Carmel. Another great place to go on vacation in California. I have never heard of the Big Sur in California. Thank you for all the great information as it makes me really want to visit it. Do you think that someone with a low-budget like would be able to enjoy a little vacation in this place? I’m not looking for anything fancy if I decide to visit the Big Sur. You can most definitely really enjoy a Big Sur California vacation on a budget. It is probably a lot more budget friendly than a lot of other coastal destinations in California. Thanks for stopping by! Wow, Big Sur is just amazing! I am really looking forward to a California vacation along the coast. Found your site, and now I am really in a pickle as to where to go. I am thinking about Big Sur, just for all the beauty. Tank you so much for this great article! You are right, Big Sur is amazing and one of the places on the central coast of California that is worth a vacation to. You will also be able to get to other coastal communities in the area if you want to and have the time. Really depends on how long you vacation for. That’s it! California is too big> Therefore I have to spend the rest of my life on a beach. That’s just how it’s gonna be. Agreed! But then I live on the beach 😀 Glad you enjoyed Patrick, and thanks for stopping by! I love your Post and your website! It’s beautiful and I want to go to all these places. I think my next vacation, when I can get off work lol, will be to Pfeiffer Beach, it seems so beautiful and relaxing. Thanks for this Post! Glad you enjoyed Emma! Pfeiffer Beach will be a great place to relax! Thanks for stopping by and reading about a Big Sur California Vacation. I love the California coastline. It is so beautiful. Sand Dollar beach looks like it will be on my wishlist for my next California vacation. It is beautiful Melinda. Yes, Sand Dollar beach is a great choice for a beach visit in Big Sur. Thanks for stopping by Beach Travel Destinations. Great article. The whole website is breathtaking and inviting. I have been looking at taking a vacation somewhere on the California coast, and just doing some research on where I want to go. Here I find your wealth of information on everything I need. So many places on the California coast, all beautiful. Big Sur definitely catches my attention! Thanks for the info. The central coast of California is beautiful, I have to agree and any where you end up is going to be a great vacation. Big Sur definitely has a lot to offer. If you have any additional questions, please don’t hesitate to ask! Hey Leahrae! I live in Santa Cruz right up the coast from Big Sur. It is quite breathtaking to be so near to such stunning scenery. I like it very much. I have not camped in Big Sur yet and I need to do that. I do have a question. Are you planning an article on Natural Bridges state park? It is right in Santa Cruz and I would love to hear your thoughts on the attraction. I just downright enjoy the stunning arches off the coast. Alex, you are soooo lucky to live so close to Big Sur! I agree that the whole area is absolutely breathtaking and hiking and camping there, wonderful. National Bridges State Park is worth it’s own review, that is for sure. I will shoot you an email when I have completed it, thanks for the great idea. Thanks for stopping by Beach Travel Destinations Alex. 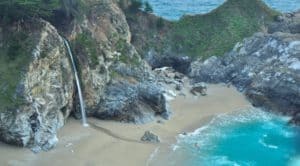 Lovely vacation guide on Big Sur California! I have been thinking about a vacation here, and just looking for information. So glad I found your site. Everything I need to plan is right on your website. We were planning on a week in Big Sur. After looking at all the information, seems like we might want to try and stretch that some. Thanks! You can absolutely do a week in Big Sur. You will be busy if you want to see all the sights, and 2 weeks would give you more time. But you can always go back 🙂 Thanks for stopping by my Big Sur California Vacation guide. Stop by again ! I have been planning a vacation for some time now and I have been considering going to USA but wasn’t sure which state to go to. I’ve always wanted to go to California so I might add this vacation to the list of things to do. You are welcome Josh, you will absolutely love California. It definitely has some to offer everyone! Please let me know if you have any other questions! 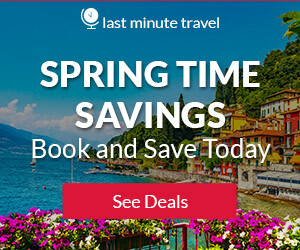 What a nice in-depth travel guide! Great details on the attractions, what to expect weather-wise, etc. Nice post! Thank you Aris! Glad you enjoyed visiting beach travel destinations! It was what I was aiming for Jamaar 🙂 I am glad you enjoyed your visit for a wonderful Big Sur California Vacation. Fantastic article. That picture of the bridge on top I want to cross I have loved bridges since I was a kid, It’s almost like a roller coaster ride for me. Watching the video was breath taking. 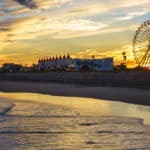 Question the beaches it shows in the video are they walkable? It looks like an amazing place to visit and really will love to go. Yes, of course the beaches are walkable 🙂 And yes, it is breathtaking. 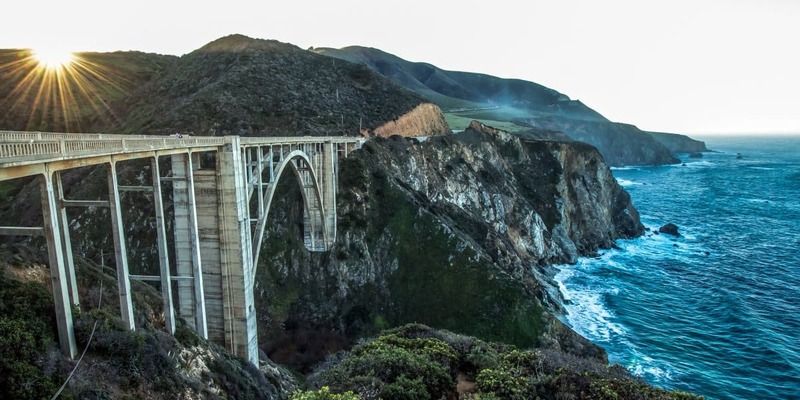 The bridge, Bixby Bridge is pretty famous and worth a visit when here. Thanks for stopping by! Great Ahmed! You will love Big Sur, a bit of a change from my pure coastal beach posts. Of course, you do have beaches here, but so much more! Thanks for stopping by and reading about a Big Sur California Vacation. Oh, I would absolute love a sight-seeing vacation. I like sites like this that give great information before I travel somewhere. A Big Sur California Vacation is definitely a sight seeing vacation! 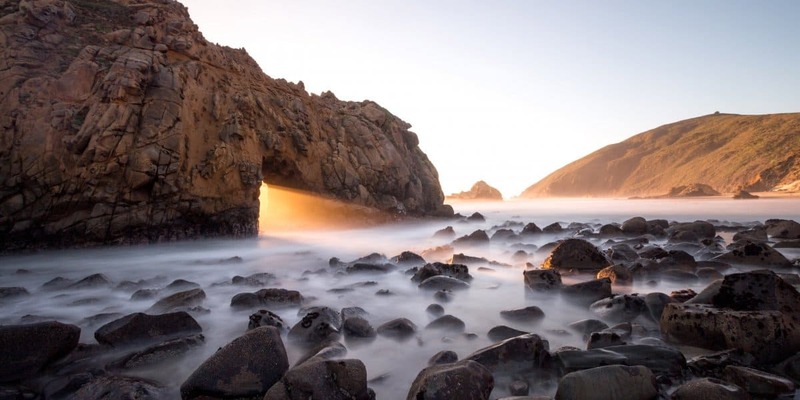 If you love the outdoors, hiking, even a great beach, than you will love Big Sur. Thanks for stopping by Beach Travel Destinations! 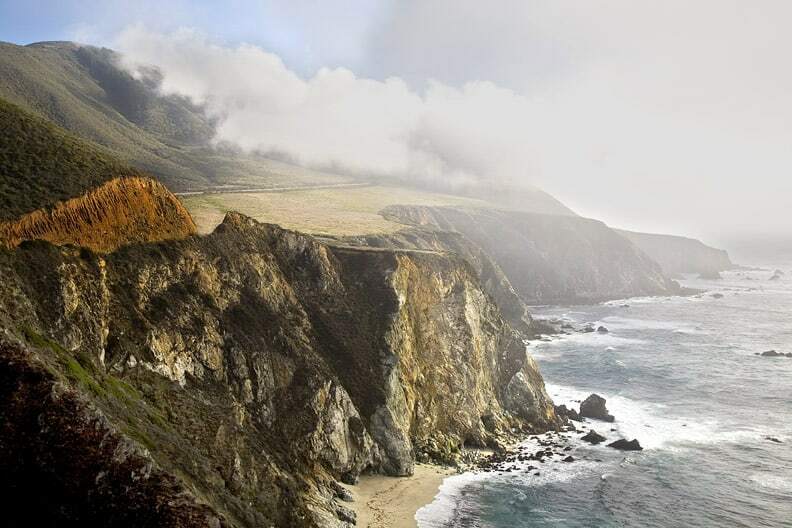 This is a terrific article on Big Sur. I spent a week years ago with a hiking buddy doing day hikes in this area. We had a great time hiking and visiting tourist stops along the way while listening to Country Joe and the Fish and Janice Joplin and other stoners from the 60’s and 70’s. Well, I will be visiting Big Sur again next summer with my wife, and I found this article to be a great source of information for this trip. Thanks for doing the research for us. It is a great area for hiking, that is for sure. More so than for beaches. You and your wife are going to have a wonderful time! If you need any additional information, please let me know.